We’ve started the 2017 western trip, having blazed through Livingston, Louisiana (nice RV park), survived the pavement hell of Louisiana and Eastern Texas, stayed overnight at Columbus, Texas (OK, but not up to our standards), and finally arriving in San Antonio. At first, we weren’t sure we’d even make this stop, seeing as how we were trying to orchestrate our stops to spend the smallest amount of time meandering along through places with little to commend them. But neither of us had ever been to San Antonio, so what the heck? It’s on the way, sort of, so a couple days layover made sense. And we are really glad we did. Tops on my list was going to the Alamo. I didn’t realize it, but this is *not* “the Alamo.” This is the church inside of what was the Alamo. The Alamo, as it existed in 1836, extended several blocks in all directions. Unfortunately, most of that area is now developed and only this church, and a small surrounding area, survive. The legend of that battle has been imprinted on my mind since elementary school, but what we learned on our visit is that reality is even more dramatic than the childhood stories we all grew up with. It’s hard to imagine: 150 volunteers, plus or minus, against a determined army of maybe 10 times that number; Santa Ana’s raising of the red “no quarter” flag; and the last-minute realization that help would never arrive. In these circumstances, William Travis called the men together and said, in essence, “Look, here’s the deal. Reinforcements are not coming. We cannot defeat an army of this size, and if we stay and fight, the result is certain death for all of us. But we fight for principles that matter and we only have two other choices: surrender or flee, either way announcing to our countrymen that freedom and liberty are not worth dying for. It’s not for me to tell you what to do,” and then, drawing his sabre and carving a line in the sand, he continued, “but I intend to stay and fight and die right here, because I believe liberty, and patriotism, and everything that is dear the American character are worth dying for. And I ask any man who’s willing to stand with me to cross this line.” At that moment, every one of the volunteers (save only one!) crossed the line. And they stayed and fought, dying either in the ensuing battle or, if wounded and captured (including, perhaps, Davey Crockett), when lined up against a wall and shot. The rest, as they say, is history. 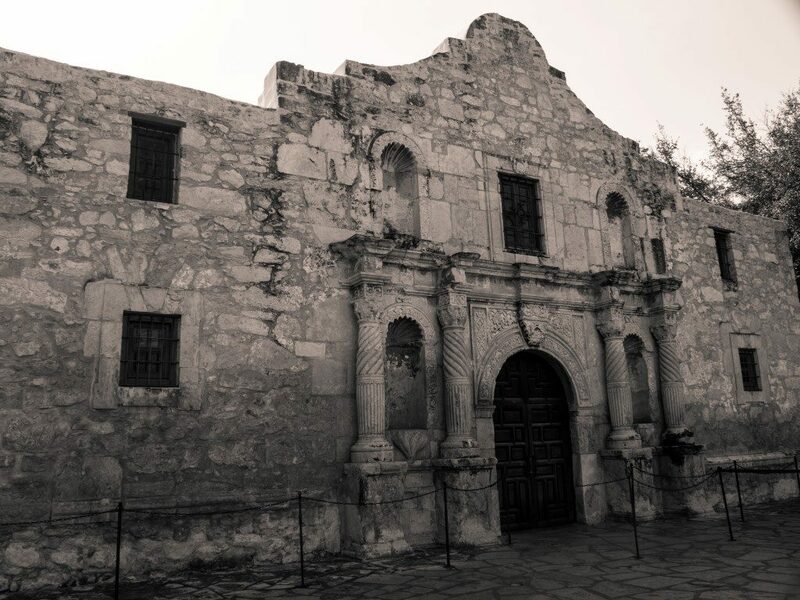 As has happened so many times over our history, the enemy’s “victory” inspired a sense of American outrage, which led to an overwhelming response, which led to a crushing defeat of Santa Ana and his army, which forced Santa Ana to save his hide by signing a treaty relinquishing the territory, and the Republic of Texas was born. As often as this pattern of events seems to repeat itself, Wendy and I sometimes wonder whether our national motto should be changed from E Pluribus Unum to Non Ursa Poke. Our second objective was San Antonio’s famous River Walk. In 1921, a disastrous flood hit San Antonio, and the city planners did what such people always do in such cases … they decided to channelize the portion of the river that ran through downtown, and then pave over it. As it turns out, though, they encountered the dreaded little-old-ladies-in-garden-clubs contingent. Under the impetus of that formidable force, the idea of channelizing the river remained, but it’s flow was regulated by an upstream dam and a plan created to develop the corridor. Later on, through the efforts of the WPA, some 17,000 feet of walkways, bridges, and landscaping were added along the channel. Over the years, the number of restaurants, bars, and shops increased, the size and layout of the River Walk changed and grew, and it now stands are one of the most successful urban projects of its type, serving as a model for countless other developments, including the Little Sugar Creek Greenway in Charlotte, NC. And it is completely charming. 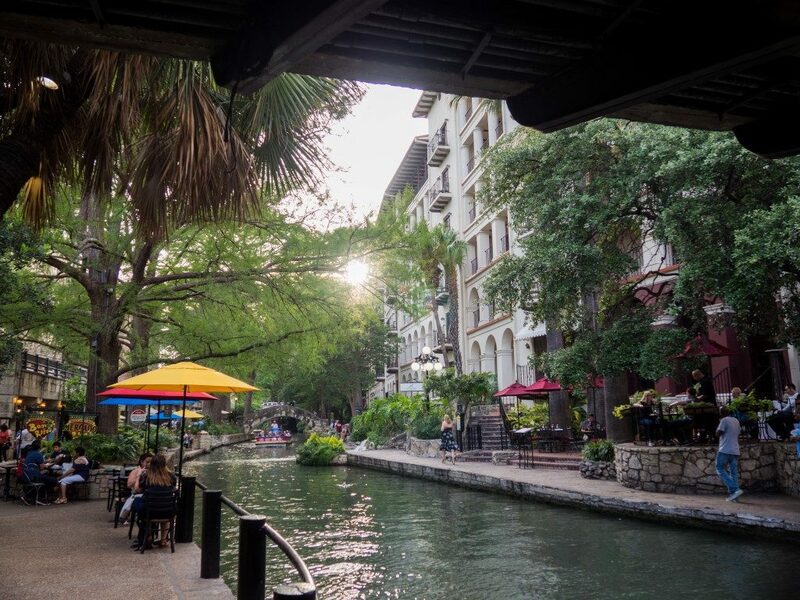 It’s hard to describe the stunning beauty of the River Walk. This is not a fake picture. This is a snapshot I grabbed as we strolled along the path one night. Even more, our visit to San Antonio also coincided with the city’s annual “Fiesta” (sort of a Hispanic version of Mardi Gras), and as we had dinner one night at a River Walk restaurant, we were treated to periodic concerts by passing boats filled with high school Mexican bands (guitars, violins, trumpets, and all that) gearing up for their upcoming competitions. Oh, and one more thing. 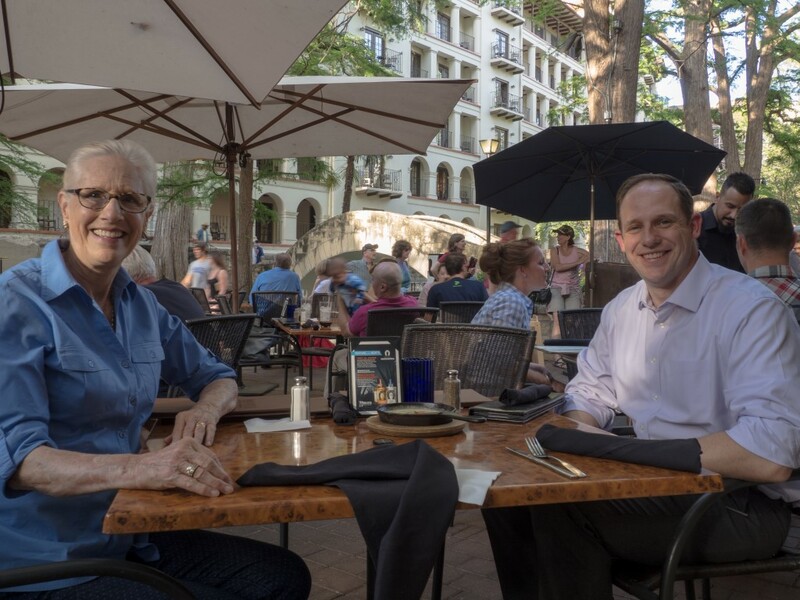 In one of those improbable coincidences that proves something, Son #1 had a business to San Antonio while we were there and we met up for dinner! Sitting along the River Walk, with Mexican bands in the background and enjoying, let’s see … a few margaritas, a couple glasses of wine, two hors d’oeuvres, exceedingly large entrees, and two orders of crème brulee. Such things are what make travel “broadening” (at least in the sense of girth). Next stop: Big Bend National Park. This entry was posted in Travels on April 28, 2017 by skiprd. We leave in a couple weeks for this year’s trip out west (more on that below), but prior to the trip it was time for our “traditional” pre-trip campout with the with Little Darlings. I say “traditional” because we did a pre-trip campout once, and the way our family works, once is enough to create a tradition. And once a tradition is established, we can never not do it because, well, it’s a tradition. All of which leads to a geometrically expanding list of spontaneously generated random obligations. And I put “we” in quotes because Wendy is out in Seattle with the other Little Darlings, spending Easter with Laura while Robert is deployed, and wasn’t here for the campout. This year’s campout was a great success, although not for the reason I expected. Cliff selected the location (FD Roosevelt State Park), which is only 30 miles from the LaGrange house, so I went over early to snag the best sites, Cliff showed up around noon, and Jennifer showed up mid-afternoon. 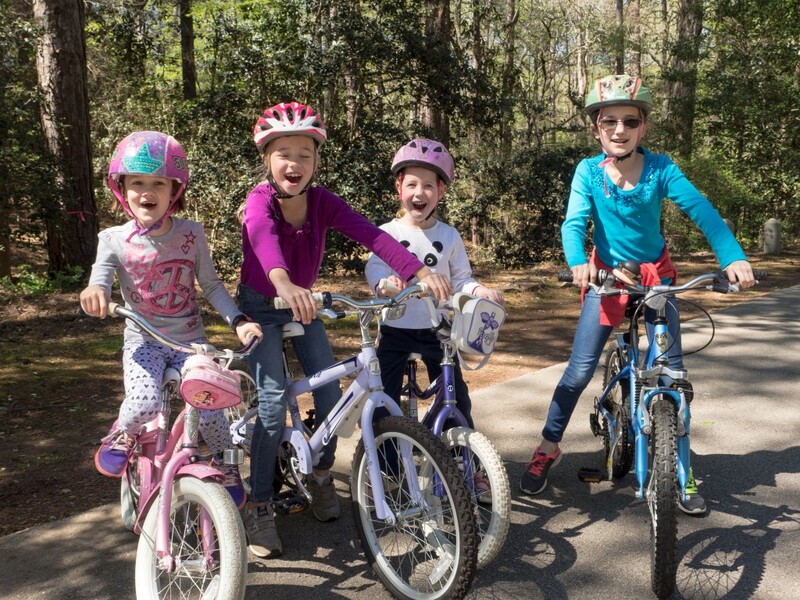 We all assumed that we would occupy ourselves with an excess of activities at the campground and nearby Callaway Gardens. Some that turned out to be true, and in fact we did ride bikes at Callaway, go to the butterfly house, have a picnic lunch, and watch the birds of prey show. Riding bikes from the Discovery Center to the butterfly house, a distance we thought would prove too much for the younger cousins. Not so, though. All of them showed themselves determined not to quit. I have no idea where they got that trait. And, at the campground, we skipped the park-provided hot dog supper, Eggstravaganza Easter egg hunt, archery, reptile encounter, and night hike and picnic, limiting our in-park activities to Saturday night’s bluegrass concert. 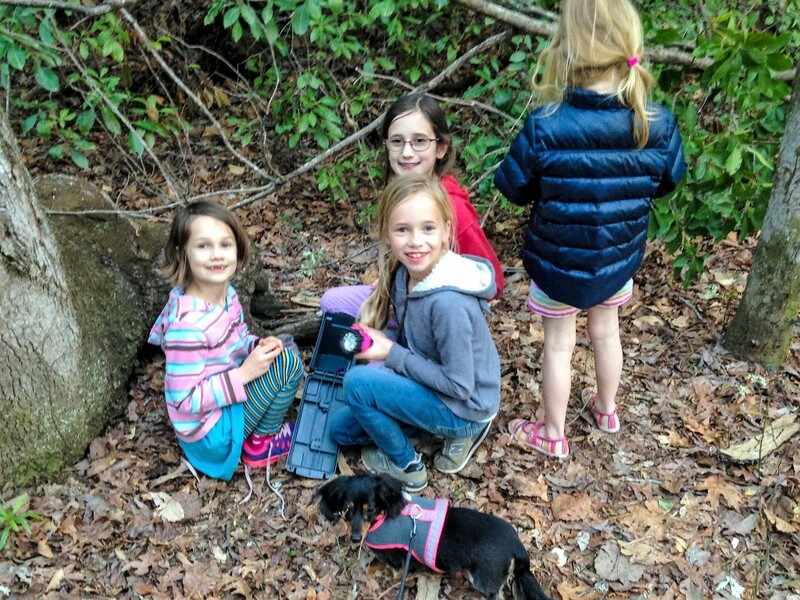 But what most occupied us was the girls’ fanatical commitment to geocaching. For those not familiar with the activity, geocaching involves using a GPS (or a GPS-enabled app on a smart phone) to find various “caches” that others have hidden in the woods, often containing little dime-store trinkets that one can exchange for other dime-store trinkets brought along for just that purpose. An good description of geocaching and all that it entails can be found on the Geocaching 101 website. I forget which cache this is, but it’ll give you the idea. The cache was contained in an ammo box hidden under some rocks about 20 yards off the trail. The app we used (Cachly) displays a compass with an arrow indicating the bearing and range to the cache, and then it’s a matter of following the app until close to the cache location, at which point it becomes a challenge to figure what the dastardly owner did to make the ammo box hard to find. The kids had a total blast and the experience gave me grounds for optimism as well. Except for the usual risks of running around in the woods, which are numerous (ticks, rattlesnakes, slippery rocks, cuts, bruises, poison ivy, etc.) but usually not totally fatal, geocaching is a completely fun activity for kids, and the grownups can turn the kids loose and let them have as much UNSUPERVIZED fun as they want. I read an article once that noted it wasn’t that many years ago, certainly during my lifetime, that except for the time when they were actually in school, kids were basically free of adult supervision by the time they were eight years old. Heck, we used to jump on our bikes and ride to school at that age, and to the park, and to the “wash” (a dry river bed), and the ball fields, and the local 7-11, and the parents had no idea where we were or what we were doing. The only requirement is that we had to be home “by the time the street lights come on.” Living that way not only required parents willing to let their kids loose at what appears nowadays to be an early age, it required children willing to venture out without someone at hand to protect them. On both counts, those days are gone. Good grief, it sometimes seems like even college students nowadays can’t survive on their own without adults providing them with safe rooms and pacifiers. So, I’ve wondered whether the biological/psychological/emotional capabilities that allow parents to leave their kids alone and kids to thrive on their own have been lost. Nope. A campground is the perfect place to turn the LDs loose and let them do whatever they want, and adding geocaching to the mix and letting the kids run around in the woods, on their own, unsupervised, makes it even better. So, with the pre-trip campout in the books, it’s now it’s time to get ready for the trip out west. This year’s trip will take us to San Antonio, Big Bend National Park, up to Carlsbad Caverns and White Sands, then to Tucson to visit Wendy’s sister, then up to Petrified Forest National Park, Mesa Verde National Park, Blanding (Utah), all five Utah national parks, and then down to the Grand Canyon. With the exception of Mesa Verde, I’ve never been to any of these places. Forty-seven days and 5300 miles. Further updates to start in late April. This entry was posted in Travels on April 11, 2017 by skiprd.